Audiologists test patients’ hearing, and examine patients who have balance —or other—ear problems. Most audiologists fit patients with hearing aids, and monitor their hearing over time. Because hearing loss can influence a person’s well-being, audiologists evaluate psychological health, and determine a patient’s coping skills before they recommend treatment. 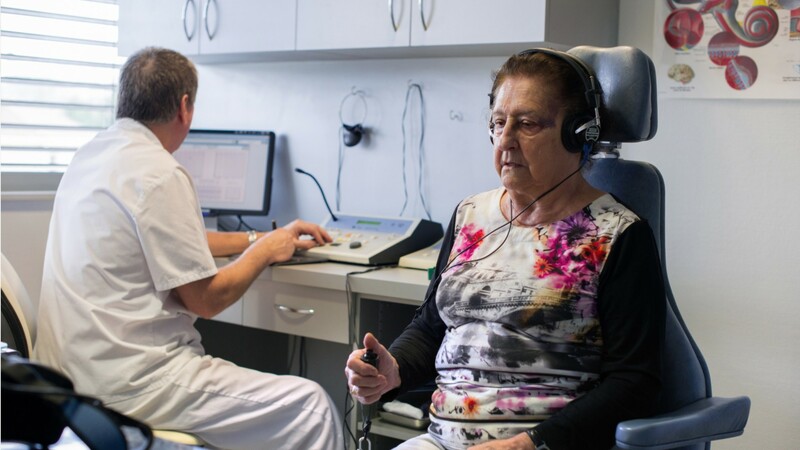 They treat balance disorders with special exercises, clear ear wax from ear canals, and may fit patients with cochlear implants for some types of deafness. They may also do research or educate people on how to prevent—or cope with— hearing loss. Compassion is essential in virtually all healthcare careers, but audiologists in particular need the patience and perseverance to find solutions for patients who may be frustrated and anxious due to hearing or balance problems. They need strong communication skills to help patients and their families understand diagnoses or treatment options. Most audiologists work in hospitals, doctors’ offices, and clinics. Some work for school districts or in pharmacies. Most audiologists work full time, including some evenings and weekends, although a significant number are employed part time. Audiologists need a doctoral degree and must be licensed to practice in a particular state. Requirements vary by state. Doctoral degrees in audiology typically take 4 years to complete; candidates may apply to enter programs after earning a bachelor’s degree in any field. See more details at O*NET OnLine about audiologists. Audiologists by U.S. Department of Labor, Employment and Training Administration is licensed under a Creative Commons Attribution 4.0 International License.